Should you be supplementing with MSM? This ingredient could give you a boost when it comes to decreasing muscle soreness and recovery time. 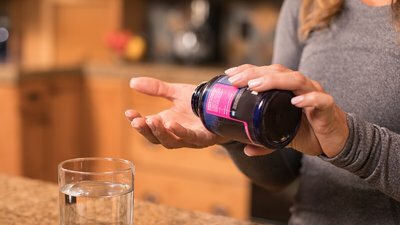 Find out all of this supplement's potential benefits. Methylsulfonylmethane, also known as MSM, is a dietary supplement. It has gained popularity in the past few years as many large-scale studies suggest it may provide a variety of health and performance benefits. Namely, MSM has been shown to decrease pain and inflammation associated with exercise, reduce oxidative stress, and enhance recovery. In this ingredient guide, we'll explore the data on MSM to help you decide whether it is worth considering for your supplement routine. Methylsulfonylmethane (MSM) is a chemical that bubbles up from the sulfur inside the earth into marine environments like oceans, rivers, and lakes. From there, it seeps into the soil. MSM contains organic sulfur, which is considered an essential dietary mineral. Sulfur is the third most abundant element in the body relative to body weight. Due to its small size and high ability to permeate cell walls, MSM is taken up from the soil by plants and further concentrated in the animals that eat them. This is why MSM is naturally found in many common foods, such as fruits, vegetables, and grains. MSM can also be taken in supplemental form, making it easier to ingest higher doses of MSM than would be possible from consuming natural sources alone. MSM works primarily in an anti-oxidative capacity, decreasing accumulated damage from free radicals. It is a very small molecule and can readily move in and out of cells, allowing it to have a widespread effect in the body at the tissue and cellular level. What Are the Proven Benefits of MSM? One study tested 1.5-gram and 3-gram daily doses of MSM for 30 days and found subjects recovered more quickly from resistance exercise and showed decreased muscle soreness and fatigue. New research into the benefits of MSM has shifted focus to metabolic syndrome patient populations. What Are the Side Effects of MSM? Ingestion of MSM is considered safe for humans, having been deemed generally recognized as safe (GRAS) by the FDA in 2007. A 26-week trial—the longest study of MSM usage to date—reported no adverse events, even at a dose of 6 grams per day. However, women who are pregnant or breastfeeding are discouraged from MSM supplementation due to lack of research in these populations. Are There Any Natural Forms of MSM? You probably already consume MSM in your normal diet. MSM can be found in higher concentrations in cow's milk, coffee, and tea. MSM is also naturally found in tomatoes, corn, apples, raspberries—and even beer! The concentration of MSM found in natural food sources is relatively low, however, which is why synthetic manufacturing of MSM became widespread as more and more studies proved its pain-relieving and anti-inflammatory effects. Synthetically produced MSM has the same properties as the naturally occurring version, allowing users to supplement their diets with higher doses without having to consume unrealistic quantities of food. What Is the Recommended Daily Dose of MSM? For enhanced recovery from soft tissue injuries the dose may be as small as 50 milligrams. Although anecdotal evidence shows dosage could be higher (up to 20 grams per day), the highest reported dose of MSM in the research literature is 6 grams per day in humans. What Are Possible Drug Interactions for MSM? MSM may interact with some drugs and medications to increase drowsiness, and may have effects similar to antihistamine drugs. The cost for MSM is relatively low and worthwhile for those looking to reduce inflammation and joint pain so they can get back to their normal daily activities. For the athlete or serious lifter, MSM can be a valuable addition to your supplementation routine for better post-exercise recovery and reduced joint inflammation. Parcell, S. (2002). Sulfur in human nutrition and applications in medicine. Alternative Medicine Review, 7(1), 22-44. Usha, P. R., & Naidu, M. U. R. (2004). Randomised, double-blind, parallel, placebo-controlled study of oral glucosamine, methylsulfonylmethane and their combination in osteoarthritis. Clinical Drug Investigation, 24(6), 353-363. Malinauskas, B. M., Overton, R. F., Carraway, V. G., & Cash, B. C. (2007). Supplements of interest for sport-related injury and sources of supplement information among college athletes. Advances in Medical Sciences, 52, 50-54. Butawan, M., Benjamin, R. L., & Bloomer, R. J. (2017). Methylsulfonylmethane: Applications and Safety of a Novel Dietary Supplement. Nutrients, 9(3), 290. Kalman, D. S., Feldman, S., Scheinberg, A. R., Krieger, D. R., & Bloomer, R. J. (2012). Influence of methylsulfonylmethane on markers of exercise recovery and performance in healthy men: a pilot study. Journal of the International Society of Sports Nutrition, 9(1), 46. Brien, S., Prescott, P., & Lewith, G. (2011). Meta-analysis of the related nutritional supplements dimethyl sulfoxide and methylsulfonylmethane in the treatment of osteoarthritis of the knee. Evidence-Based Complementary and Alternative Medicine, 2011. Pagonis, TA (2014). "The Effect of Methylsulfonylmethane on Osteoarthritic Large Joints and Mobility". International Journal of Orthopaedics. 1(1). Nakhostin-Roohi B, Barmaki S, Khoshkhahesh F, et al. (2011) Effect of chronic supplementation with methylsulfonylmethane on oxidative stress following acute exercise in untrained healthy men. Journal of Pharmacy and Pharmacology, 63(10), 1290-1294. Barmaki S, Bohlooli S, Khoshkhahesh F, et al. Effect of methylsulfonylmethane supplementation on exercise - Induced muscle damage and total antioxidant capacity. ( 2012) Journal of Sports Med Phys Fitness, 52(2), 170-174. Kim, L. S., Axelrod, L. J., Howard, P., Buratovich, N., & Waters, R. F. (2006). Efficacy of methylsulfonylmethane (MSM) in osteoarthritis pain of the knee: a pilot clinical trial. Osteoarthritis and Cartilage, 14(3), 286-294. Lopez HL. (2012) Nutritional interventions to prevent and treat osteoarthritis. Part II: focus on micronutrients and supportive nutraceuticals. PM&R, 4(5 Suppl):S155-S168.